When future generations look back on the current decade on horror, it will be difficult to ignore the rash of remakes that have populated the landscape as of late. For the most part, said remakes have taken relatively modern horror classics and franchises and have re-imagined them for the current generation; as such, it has been rather rare to see any pre-1970s properties get the treatment. Enter The Wolf Man, the 1941 Universal classic that, unlike its literary-based contemporaries (Dracula and Frankenstein), has not been subjected to dozens of iterations in the 70 years hence. Lawrence Talbot (originally portrayed by Lon Chaney, Jr.) appeared in four crossover films following the original classic and hasn’t been seen again until Universal’s recently-released (and oft-delayed) remake directed by Joe Johnston. Boasting a fair amount of production drama, which included multiple delays and two composer changes, The Wolfman has finally arrived exactly a year after its original release date. It goes without saying that such production woes generally spell trouble for the film in question, so it was with tempered expectations that I set out to partake in the return of the legendary horror character. Lawrence Talbot (Benecio Del Toro), dubbed “the prodigal son” by his father John (Anthony Hopkins) returns to his childhood home in Blackmoor after hearing about the disappearance of his brother. Upon his return, he is shocked to discover that his brother’s corpse was found lying in a ditch, apparently torn apart by a large creature. The local townsfolk have plenty of theories, the predominant of which involves the tale of a large, wolf-like creature that roams the moors with each full moon. Lawrence’s search for the truth leads him to a band of gypsies, who are soon besieged by the large creature, which ends up biting Lawrence himself. Before long, Talbot himself shows signs of being infected by the creature, and with the next full moon, he transforms into a “wolf man” himself and embarks on a carnage-filled rampage. A police inspector (Hugo Weaving),the fiancé of Lawrence’s brother, Gwen, and Sir John Talbot himself all become involved in Lawrence’s ordeal, but it soon becomes clear that only one of them will be able to truly set him free. Big budget horror films from major studios are few and far between, much less ones that contain as much A-List talent as The Wolfman. In this respect, the film is a bit of a notable event, and it would seem that no amount of production drama could completely derail a film boasting the likes of Del Toro, Weaving, Hopkins, Emily Blunt, and a respected director like Johnston—right? The answer, fortunately, is “correct.” While The Wolfman certainly has its share of flaws, it is not the debacle one would expect from a film that’s been delayed for so long. From a pure production standpoint, the film reflects every bit of its reported $85 million budget. The production design is among the best has had to offer of late, as the film transports you to late-19th century England in a seamless manner. Gothic moors, torch-wielding natives (it shouldn’t be a Universal movie without them! ), decrepit castles, and haunting crypts fill the film. Similarly, the film is as slick and polished as they come, and the classy look is certainly befitting of the property in question. One only has to spend about five minutes with the film to realize that Johnston treated the project with respect and care. Of course, good intentions and pretty packages can only take a film so far, and with a film like The Wolfman, the biggest question will always rest with the treatment of the title character himself. Del Toro’s Talbot is a bit devoid of the folksy charm that Chaney infused into the role, and he’s a bit more dark and brooding than his predecessor, but he does manage to bring that sympathetic center that made Talbot such a likeable and tragic figure in the 40s. Hopkins’s John Talbot is much different than the character Claude Rains portrayed in the original; while there was always a bit of tenseness between the father and son in that film, that conflict takes a more central role here. As such, Hopkins is a bit more edgy and even deranged at times; however, there are also times when he is charming and even funny in the role. It’s an odd performance that probably seems a bit uneven, but the plot almost demands it. Both Weaving and Blunt are serviceable in their roles, with Weaving showing the most promise as an interesting character. For the most part, he’s the requisite smarmy police inspector, but Weaving brings enough gravitas to a limited role so that he feels like more than a simple cookie-cutter character. Art Malik is perhaps the most unheralded performer among the cast, but he makes great use of his limited screen time as Singh, the Talbots’ servant. Unfortunately, it feels like there could have been more for room for this character to have a bigger impact on the film itself. The lone scene between Malik and Del Toro exhibits a good amount of chemistry between the two, and it would have been nice to see it pay off later in the film. For the most part, the actors are given solid dialogue to work with. While some of it is no doubt cliché and banal at times, the characters’ interactions seem genuine and unforced. The script’s major flaw is its predictability; even though the screenwriters added a subplot that wasn’t in the original, it’s still nothing that can’t be deduced about midway through. In fact, by the end, it feels like this is The Wolf Man by way of Werewolf of London. While the added subplot certainly raises the personal stakes for Lawrence, it’s nothing that hasn’t been seen before, and it never quite pays off with a satisfying climax (more on that in a bit). Del Toro’s performance as Lawrence is of course only half of the story with the character, with the other half resting in the hands of the effects crew that bring the title character to full life. Makeup effects legend Rick Baker handles the creature’s look, which is extremely faithful to Jack Pierce’s original design; instead of trying to reinvent the wheel and create something unrecognizable, Baker has created a look that is unmistakable as “The Wolf Man.” The creature does seem much more feral than Chaney’s ever was due to advancements in effects technology. Whereas Chaney had to prowl around hunched over, this Wolf Man can tear through the streets of London and presents a truly visceral threat. Much has been made recently about the CGI used in the creation of the creature itself, but I feel it was used in restraint when it was simply being used to augment the practical effects. The four transformations we see on screen are indeed fully CGI, which is disappointing when Rick Baker could have had another chance to create something legendary like he did in American Werewolf in London. Instead, the CGI transformations, while well done, are nothing we haven’t seen before: eyes bulge, fingers turn into claws, clothes get shredded. Thankfully, it doesn’t come off as cartoony as it could, but it’s nothing groundbreaking. Fans of practical effects will be happy to discover that there are some nice gore effects strewn in. While there is a decent dose of CGI gore, it’s never overly distracting with the exception of a few shots. And believe me, the carnage in this one is notable. Multiple decapitations, disembowelings, limb-hackings, and impalements await you, and, while this sounds very much out of tune with the original, it still works. The gore is not quite gratuitous and serves to show just how vicious Lawrence becomes once the moon takes hold of him. 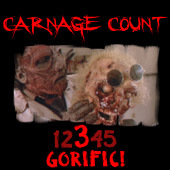 The gorehound in me was pleasantly surprised by the amount viscera that was strewn about, as this one earns every bit of its R-rating. Besides the gore, however, the film rarely plays out like a pure horror movie; instead, like the original, it’s more of a drama with a few action sequences strewn in. Johnston handles the action competently and paces the film well. The biggest gripe here is that he allows one of the film’s major conflicts to be resolved with a soulless action sequence; though the film is about a monstrous beast, the human element has always been important to the franchise, and it would have been nice if it hadn’t been lost here. Fortunately, Johnston does manage to reign it in and refocus on that element during the film’s ultimate climax. The Wolfman wraps up on a note that’s very much in the spirit of the original film, and I was happy to see that Johnston didn’t go the somewhat-expected Hollywood route. In this respect, The Wolfman is a good remake in principle because it’s faithful to the source material but doesn’t simply retread it. It should also be noted that the score ultimately used for the film is indeed Danny Elfman’s; the veteran composer was removed from the project after test screenings, but Johnston ultimately convinced the suits that Elfman was in fact the man with the job. Surprisingly, the score itself doesn’t feel overtly Elfman; instead, it’s very restrained, classic, and very befitting of the source material. Ultimately, the score is someone emblematic of the film itself in that it went through several problems, but it manages to get more right than wrong. While it certainly isn’t a flawless film and feels a bit rushed with some of the aforementioned elements, it’s a worthy successor to the original film’s legacy. Most horror fans are no doubt intrigued to see any iconic figure return to the screen, and The Wolfman more than satisfies that curiosity even though it won't ever be hailed as a classic like its predecessor. While it seems like we get a new remake with the rise of each full moon, they haven’t all been as satisfying as this one. Buy it!